Well, for starters, how about "18,821 meals from 536 airlines?" The pictures were taken by passengers and flight crews. 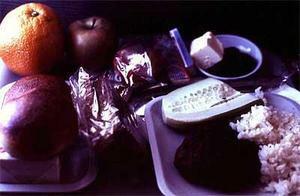 Pictured up top is the breakfast served to Robert Porter aboard Aeroflot in July of 1971 on a flight from Khabarovsk to Irkutsk. The meal consisted of a meat patty, rice, cucumber, assorted fruit, black bread, butter and caviar. Coffee and tea were served. His comments: "Caviar was served on several of the charter flights across the USSR. Cucumber and tomato salads with greens were freshly prepared on board." Porter rated the meal a 5 on a scale of 1-10.